This is the LilyPad Rainbow LED strip, with seven LilyPad LEDs that are still attached to one another, letting you snap LEDs apart at your leisure to sew into clothing or whatever else you can dream up. 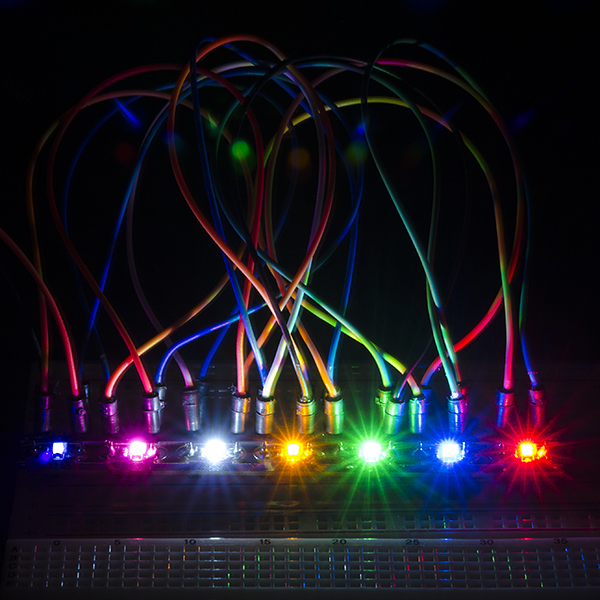 The LilyPad Rainbow LED features seven individual LEDs in six unique colors (Red, Blue, Green, Yellow, Pink, and White). Text has been added to the back of each board to indicate its color. Due to popular request, we have included two white LEDs instead of just one. Note: A portion of this sale is given back to Dr. Leah Buechley for continued development and education in e-textiles. Here we will learn how to say how you feel with pizza. Electric pizza. A short guide to creating a rainbow of new LilyPad LED colors at home! Learn how to calculate how many LEDs your LilyPad project can power and how long it will last. Use LilyPad LEDs, a switched battery holder, and coin cell battery to make a fun light up mask for your next costume party. These lights are so easy to work with and the Rainbow LED strip is a great way to get all colors needed for a project. All lights worked and lit up brightly. I would definitely buy them again as well as other LIlyPad products. These things are awesome for discreet lighting effects. They are easy and self explanitory, and are great for sewing into clothes. It did some wearable lighting for my daughter, as well as used some a couple years ago for lights on her dollhouse (which also server as a night light). Very easy to work with and lights up very colorful and bright. My 10 year old really enjoyed making her dance glove with them. Easy to snap apart, durable, and easy to use! Product arrived on time and well-packaged. I used them with students as young as first grade, and those tiny fingers found them easy to understand and place. I know this sounds glowing like the inside of some kind of hallmark card, but honestly this product made me smile waaaaaay more than a stupid card.